At the very least, you could say that Jorge Gonzales' trip into the world of professional wrestling has to be considered unique. After all, Gonzales never planned on being a wrestler. It was his energy in another sport that eventually led him to enter the squared circle. Gonzales grew up in Argentina, with the emphasis being on 'growing'. Due to his tremendous height and agility, Gonzales soon became a star basketball player in his home country. Soon, Gonzales joined up with the Argentina National Basketball team, using his height to better the team. After the '88 Olympics, Gonzales entered into the United States' National Basketball Association Draft, where he was picked in the 3rd round (54th overall) by the Atlanta Hawks. However, despite being 7'6", Gonzales was unable to make a career in the NBA, as he barely spent any time playing with the team. This didn't mean, though, that Gonzales hadn't been noticed. In 1989, Ted Turner, the owner of both the Atlanta Hawks and the National Wrestling Association's branch (later known as World Championship Wrestling), arranged for Gonzales to join up with the wrestling organization. During 1989, Gonzales trained for a wrestling career, building up his skills in a different athletic event. As El Gigante, Gonzales debuted in May '90 at Capital Combat, when he ran down with Sting to help take out the Four Horsemen during the Lex Luger/Ric Flair World Title Cage Match. El Gigante quickly became a major force in WCW, going against the Four Horsemen at every opportunity. At the '90 Great American Bash, El Gigante debuted in a match, teaming with Paul Orndorff & the Junkyard Dog against the Horsemen (Arn Anderson, Barry Windham, & Sid Vicious). Gigante spent most of his time on the apron, although he got involved in the ending brawl between the six men. The match ended when Vicious lost control, throwing JYD over the top rope to cause the disqualification. Later on that night, Gigante played a major part in Sting's victory (and winning the NWA World Title) from Ric Flair. Gigante kept Arn Anderson at bay, having been handcuffed to him before the match. For the next few months, El Gigante continued to work on becoming a better wrestler, feuding with the Four Horsemen, among others. He also rarely appeared on the big shows for NWA/WCW. El Gigante was scheduled to wrestle at Clash of the Champions XIII, in a six-man match, teaming with the Southern Boys against the Fabulous Freebirds. Before the match, though, the Freebirds surprisingly announced that they had beat up Gigante in the back, supposedly stuffing him in a box bound for Argentina! It was untrue, though, as Gigante later chased the Freebirds from the arena. In '91, El Gigante finally started getting some momentum going, as his feud with Sid Vicious erupted again. The two settled their differences at Superbrawl '91 in a "Stretcher" Match. It wasn't a long match, as Gigante got the upper hand and took out Vicious with his Claw. Gigante didn't have time to celebrate, though, as the One Man Gang attacked the big man, leading to another feud between giants. During that feud, though, Gigante also tried to help Brian Pillman in a "Loser Leaves Town" Match against Arn Anderson & Barry Windham. Things didn't quite work out the way Gigante & Pillman wanted, though, as Windham was able to pin Pillman to win the match. Since Gigante wasn't pinned, he didn't leave WCW (and Pillman would return as the Yellow Dog). Gigante and the One Man Gang met up at the '91 Great American Bash, with the Gang using any weapons at his disposal to try to take down the giant. It backfired, though, as Gigantes kicked the Gang's own powder back into the Gang's face, allowing Gigantes to take the Gang down and get the victory. 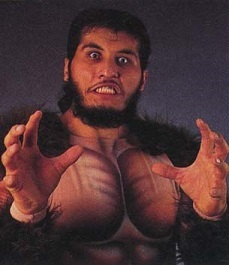 Gigante's run in WCW continued over the next few months, as his size kept him a force in the organization. At Clash of the Champions XVI, Gigante struck again, managing to toss out the One Man Gang and the Great & Mighty Oz (aka Kevin Nash) to win the Georgia Brawl Battle Royal. Gigante later joined up with Sting & the Steiner Brothers to feud with Cactus Jack, Big Van Vader, Abdullah the Butcher, & the Diamond Stud (Scott Hall). The two groups met at Halloween Havoc '91 in the infamous "Chamber of Horrors" Match, which was won when Abdullah was fried in an electric chair! Truly one of the strangest matches ever put on. El Gigante finished up the year at Starrcade '91, where he was part of the Battle Bowl match-ups. The rule was that partners were chosen randomly for the tag-team portion of the tournament, with the winners going to the final match. Gigante found himself teamed up with Larry Zbyszko to take on Richard Morton & Dustin Rhodes. Although Gigante did well agianst both opponents, he soon had enough of Zbyszko trying to boss him around, tossing Zbyszko into a double-team and abandoning him to get pinned. It was a good moment for Gigante, but it also kept him out of the Battle Bowl match (which was won by Sting). It was also Jorge Gonzales' last PPV match for WCW, as he would leave the company and tour overseas in '92. At the World Wrestling Federation's '93 Royal Rumble, the Undertaker was dominating the main event, tossing out guys left and right. However, the Undertaker was then met by a massive man in a "chest" body suit, who, despite not being part of the Rumble, sent the Undertaker out of the ring. This was the debut of Giant Gonzales, with the managerial skills of Harvey Whippleman at his side. The two large men feuded over the next few months, leading to Wrestlemania IX, where they met to settle their differences. After a long fight, Gonzales tried to resort to trickery, as Whippleman gave him a chloroform-soaked rag to knock the Undertaker out. Unfortunately, the ref was watching, as he called for the disqualification, giving the win to the Dead Man. It was during this time that Gonzales made an interesting television appearance, showing up on Baywatch while still dressed in his bodysuit. Gonzales would later appear on other shows, such as Thunder In Paradise and Hercules, usually as the bad guy. 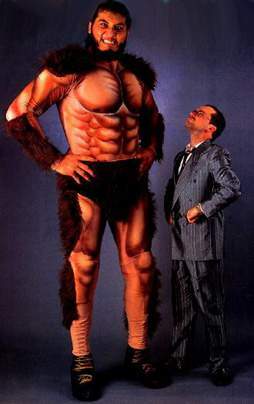 Back in the WWF, Gonzales continued to feud with the Undertaker throughout the summer months, with the Dead Man helping cost Gonzales his opening match against Tatanka in the '93 King of the Ring Tournament. Gonzales and the Undertaker met again at Summerslam '93, in a "Rest In Peace" Match. Basic rules were No Countout and No Disqualifcation, allowing either man to do whatever he wanted. Gonzales held the edge early on, thanks in part to Whippleman having control of the Undertaker's urn (stolen earlier in the feud). But when Paul Bearer returned and took back the urn, the Undertaker fired up, eventually finishing Gonzales with a Top-Rope Clothesline to end the feud. Afterwards, Gonzales angrily took out Whippleman, then left the ring. He would leave the WWF soon after, heading back overseas to New Japan for a while before retiring from the ring due to health issues. Later reports stated that Gonzales, who lived back in his native Argentina, was facing serious health issues due to his size. He was reportedly unable to stand without support, and spent much of his time in a wheelchair. He was using a dialysis machine to treat kidney failure. On September 22nd, 2010, at the age of 44, Jorge Gonzales passed away, due to complications from his diabetes. He might not have had a hall of fame career in either the NBA or professional wrestling, but one thing's for sure: El Gigante/Giant Gonzales will be remembered for his contributions to sports entertainment. - NWA Great American Bash '90 (July 7) = El Gigante, Paul Orndorff, & the Junkyard Dog won, via DQ, over Arn Anderson, Barry Windham, & Sid Vicious. - NWA/NJPW Super Show (March 21, '91) = El Gigante forced Curtis Hughes to submit. - NWA Superbrawl I (May 19, '91) = El Gigante won a "Stretcher" Match over Sid Vicious. - WCW Clash of the Champions XV (June 14, '91) = El Gigante & Brian Pillman lost a "Loser Leaves Town" Match to Arn Anderson & Barry Windham (Pillman took the pin). - WCW Great American Bash '91 (July 14, '91) = El Gigante defeated the One Man Gang. - WCW World Tag-Team Title Tournament (July/September '91) = El Gigante & Big Josh lost in the first round to Black Blood & the One Man Gang. Arn Anderson & Larry Zbyszko won the tournament. - WCW Clash of the Champions XVI (September 5, '91) = El Gigante won a "Georgia Brawl Battle Royal" Match. - WCW Halloween Havoc '91 (October 27) = El Gigante, Sting, & the Steiner Brothers won a "Chamber of Horrors" Match over Cactus Jack, Big Van Vader, Abdullah the Butcher, & the Diamond Stud. - WCW Starrcade '91 (December 29) = El Gigante & Larry Zbyszko fell to Richard Morton & Dustin Rhodes. - WCW/NJPW Super Show II (January 4, '92) = El Gigante fought to a Double Disqualification with Big Van Vader. - WWF Wrestlemania IX (April 4, '93) = Giant Gonzales lost, via DQ, to the Undertaker. - WWF King of the Ring Tournament '93 (June) = Giant Gonzales lost in the first round to Tatanka. Bret Hart won the tournament. - WWF Summerslam '93 (August 30) = Giant Gonzales lost a "Rest In Peace" Match to the Undertaker. - NJPW Fukuoka Dome (May 4, '94) = El Gigante pinned Tadao Yasuda.